Peter Moran original etching "Noonday Rest"
Medium: original etching. A nice impression on cream laid paper, published for the American Art Review in 1880; the American Art Review was a lavishly produced revue featuring original etchings by Moran and other leading American artists of the era, which only lasted three years and is now quite scarce. Plate size: 4 x 6 1/4 inches. Not signed. 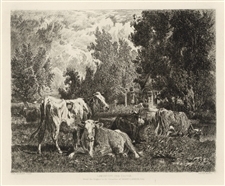 Peter Moran etching "Landscape and Cattle"
Medium: etching (etched by Peter Moran after Van Marcke). Printed on cream laid paper and published in Boston in 1888 by Estes & Lauriat. Plate size: 6 3/4 x 8 5/8 inches. Not signed.